Where to find Deux-Montagnes hotels near an airport? 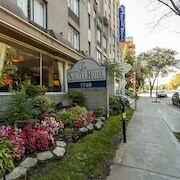 Where can I find hotels in Deux-Montagnes that are near tourist attractions? Are you looking for an apartment or hotel in the heart of Deux-Montagnes? Within 0.1 kilometres (0.06 miles) of the heart of town, you can find 8 Expedia-listed accommodation options. 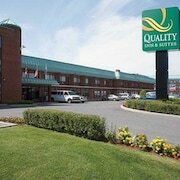 One of only a small number of hotels close to the center of Deux-Montagnes, is the Motel St-Eustache. 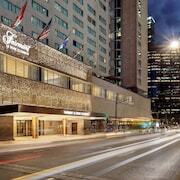 Check out the Montreal Airport Marriott In-Terminal Hotel and also the Château Vaudreuil Hôtel & Suites. The Montreal Airport Marriott In-Terminal Hotel is located 15 kilometres (10 miles) away from the heart of Deux-Montagnes. The Château Vaudreuil Hôtel & Suites, is positioned 17 kilometres (10 miles) away. 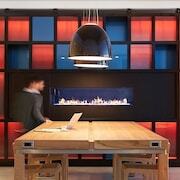 Two more hotels include the Hôtel Ruby Foo's and the Le St-Martin Hotel & Suites Laval. Once you have explored Deux-Montagnes, you could set out to discover the many other delights of the Montreal - Monteregie area. Montreal - Monteregie has forests, rivers, lakes and mountains. Popular Montreal - Monteregie visitor attractions are old towns and churches. Adventurous travelers may enjoy skiing, cross-country skiing and ice skating here. 25 kilometres (16 miles) to the east of Deux-Montagnes is Downtown Montreal, home to the Musee des Soeurs Grises and Musee des Hospitalieres de I'Hotel-Dieu de Montreal. If you'd like to visit Downtown Montreal, be sure to check out the Auberge de La Fontaine and Ritz-Carlton, Montréal. 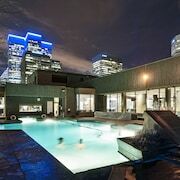 25 kilometres (15 miles) to the east of Deux-Montagnes, you'll also find Saint Laurent Boulevard, home to the Hotel Le St-James Montréal and W Montreal. Whether you're just passing through or staying in Saint Laurent Boulevard, make sure you visit the L'ile Notre -Dame Beach and Olympic Basin. Before you head home from Montreal, why not make sure you catch some sport. Visit Olympic Stadium to the east of Deux-Montagnes. Sports fans wanting to stay close to the stadium can choose from the Loft Hotel or the Auberge Le Pomerol. For travelers planning on arriving through Pierre Elliott Trudeau International Airport, you can book a room at Hampton Inn & Suites by Hilton Montreal-Dorval, or Sheraton Montreal Airport Hotel, which are both nearby. 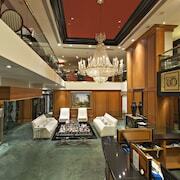 What are the most popular Deux-Montagnes hotels? Are there hotels in other cities near Deux-Montagnes? 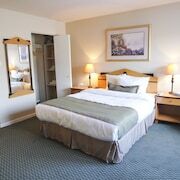 What other types of accommodations are available in Deux-Montagnes? Explore Deux-Montagnes with Expedia.ca’s Travel Guides to find the best flights, cars, holiday packages and more!